Oral hygiene is no joke. Nobody—not a single person—likes a mouth full of not-so-pretty teeth or terrible breath. And who wants some hellacious halitosis to get in the way of their wedded bliss or their social life?! I try to take care of my teeth to the best of my ability. Aside from bad breath and discoloration, not taking care of your teeth can lead to gingivitis, gum disease, tooth loss, and a host of other problems. And while I’m not sure how much I believe it, there is some evidence suggesting that gum disease is linked with chronic conditions like diabetes, kidney disease, and heart disease (although I do think these conditions are a result of diet). Flossing Your Teeth Every Day…Is There a Point? Since about 1908, the main tenets of oral hygiene have been brushing and flossing. But new research is saying that flossing ain’t all it’s cracked up to be. In fact, the latest version of the USDA Dietary Guidelines for Americans doesn’t include flossing as a component of oral health…and a new study is saying there is no evidence it has any real benefit at all. It’s actually surprising because lots of debris and plaque can get lodged between your teeth—and anyone who’s ever looked at a piece of floss after getting up in the nooks and crannies knows it’s doing something—but when done as an accompaniment to brushing, flossing has no real oral health benefits. So all of you who don’t floss twice a day—or twice a year—can let out a sigh of relief, because failing to floss likely isn’t doing you any harm. But this means you do have more time to make sure you do some adequate brushing. You should brush your teeth at least twice per day for at least two minutes. Make sure you hit the back and front of each tooth, and that you’re extra conscious of the teeth at the back of your mouth. Remember that just because you can’t see them, doesn’t mean they don’t exist! And be gentle, too; your teeth will appreciate it. Using floss or a toothpick may still be worthwhile if you can feel some larger pieces of food lodged between the teeth, and if you’re in the habit of flossing regularly, it surely won’t hurt. 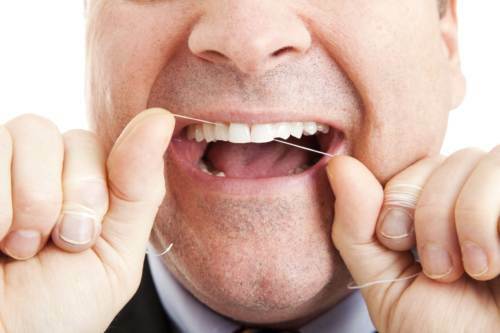 So you don’t need to quit flossing if it’s part of your daily habit and you’re happy doing it. Keeping on top of your oral hygiene is important to your overall health, so be sure to take care of your teeth. Just don’t stress if you’re not flossing regularly. “No strong proof that flossing your teeth has medical benefit,” CBC News web site, August 2, 2016; http://www.cbc.ca/news/health/dental-floss-1.3703798. “Dietary Guidelines for Americans, 2016-2020,” USDA web site; https://health.gov/dietaryguidelines/2015/resources/2015-2020_Dietary_Guidelines.pdf, last accessed August 2, 2016. Salzer, S., “Efficacy of inter-dental mechanical plaque control in managing gingivitis—a meta-review,”Journal of Clinical Periodontology, March 31, 2015; DOI: 10.1111/jcpe.12363.